Having a side job can provide you with a wonderful surplus to your income. It can be the way you pay for the luxuries you love that you might otherwise be unable to afford on your regular salary. Side jobs can be your ticket to that vacation you’ve been dying to take or supply you with clothes you’ve been dying to buy. On the other hand, maybe you want a side job to help you pay the rent, provide you with groceries, or pay for your transportation. Whatever your reason for pursuing a side hustle, there’s an array of options for you to choose from. Unfortunately, not all side jobs are created equal. You may see posts and receive offers about jobs that offer you an easy job for quick money, and like many things in life, if something seems too good to be true, it probably is. So, how do you decipher the legitimate operations and opportunities from the untruthful ones? 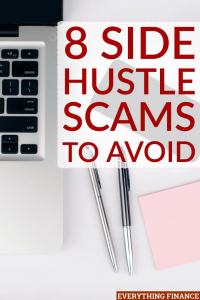 Here are 8 side hustle scams you should definitely avoid. There are unlimited companies that advertise direct sales positions, all promising you flexible hours and great success. You know the operations; the ones that you make money off of by selling their product and recruiting new salesmen. While not every direct sales company is out to harm you, think reputable organizations like Avon or Mary Kay, there’s still a handful that you likely won’t see a profit off of. Many direct sales positions also require you to purchase product up front, which means you could end up spending more of your own money and making none in return. While not exactly a side hustle scam, you do have to be careful with direct selling companies if you really want to make money. Working freelance whether that be through writing, designing, drafting, or programming can be a great way to utilize skills you may already have while providing you with the opportunity to make extra cash. Furthermore, there are plenty of sites, like Freelancer.com, and postings for people looking for freelance help. Unfortunately, while many of the job prospects on these sites are legitimate, there are still those that hope to scam you. Be wary when accepting or inquiring about a particular offer. Make sure the posting gives you complete details and a description of the job you’ll be doing and that they use a verified payment method. Another important thing to remember when freelancing is to be cautious of providing free samples, don’t get tricked into doing the work for free. And always avoid side hustle scams that ask you to pay a fee of some kind in order for you to get the job. Again, while there are some data entry jobs that will produce real results, there are also quite a few out to merely get your money. Many scam companies will offer you a job, but only after you’ve paid a fee to access the information and program or paid in-full for a specific program their company uses. Of course, once you’ve paid your fee or for the program, no job actually exists. This is one of many classic side hustle scams that many people have fallen for. Who wouldn’t love to get paid to shop at some of your favorite stores? These positions offer you cash for shopping at various stores and providing them with your feedback based on the experience you had. Unfortunately, some sites and offers will only provide you with the job and its details after you paid a certification or registration fee, which of course is where you would get scammed. Legitimate companies and sources won’t ask you for any type of payment upfront, so steer clear of any that do. Generally, doctors and medical offices don’t let just anyone handle medical billing, and instead choose to use larger and reputable companies. After all, the information you would be handling is most likely private. That being said, most work-from-home medical billing jobs aren’t always what they seem. Again, for a fee, you’ll receive materials that will train you, provide you with the appropriate software and offer you valuable leads. More often than not, however, you’ll never receive a training session and your leads don’t actually lead you anywhere, ergo costing you money in the long-run. Typing sounds like a wonderful and easy way to make money. After all, our society spends all its time on computers, which means we should all be pros at this. Typing scams offer you great money to type at home, by once again, requiring a start-up fee from you in order to send you helpful leads. Once again, however, these leads aren’t usually useful at all. Filling out surveys seems like an interesting and fun way to make quick money. However, the way many of these side hustle scams are set up to require you to put in lots of time before actually making you any money. Most of the time, you’ll only receive a small amount of change per survey, maybe even pennies, which means it can take forever to make $1. It’ll likely take you weeks and months of your time to make any money at all. So, while not as straightforward of a scam as some on this list, surveys are still a waste of your time that could be used in far better ways. You’ll often find an array of personal driver positions on sites like Craigslist. Unfortunately, unless you’re actually driving with a company like Uber, you’ll probably find that these jobs aren’t what they seem either. Postings for drivers usually ask you to chauffer the poster or someone else around, but can make payment quite confusing. They’ll send you a check (fake of course) have you deposit it, withdraw it, keep so much and send the rest back. Unfortunately, since it’s a fake check that means you’re actually giving them your hard-earned money instead. There are many creative, easy and fun ways to make money on the side and plenty of companies, sites, and opportunities that can help you find just that. Nonetheless, there are also lots of people out there hoping to trick you out of your money and valuable information. So, before accepting the first side job you find, especially online, do your research to ensure they’re a legitimate operation. And at the end of the day, go with your gut, because if something feels uneasy, it is probably one of many side hustle scams. What are some legitimate side hustles you’ve had? Have you ever been tricked into any side hustle scams?